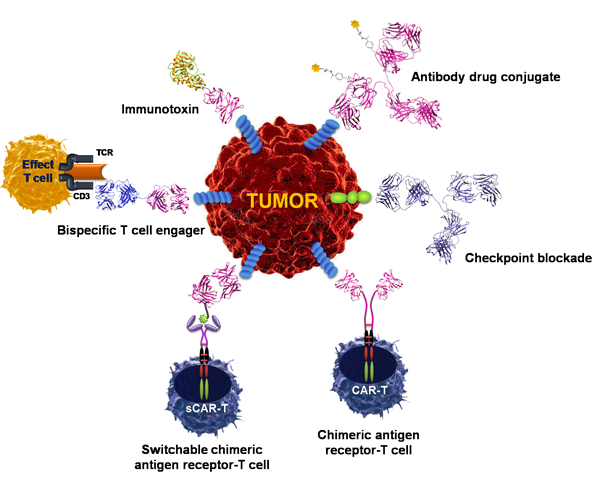 During the past decades, anticancer immunotherapy has evolved from a promising therapeutic option to a robust clinical reality. Many immunotherapeutic regimens are now approved by the US Food and Drug Administration and the European Medicines Agency for cancer patients, and many others are being investigated as standalone therapeutic interventions or combined with conventional treatments to improve the clinical efficacy. By critical thinking the distinct cell killing efficacy and potential unwanted toxicity of different targeted strategies, Dr. Cao’s lab is building versatile platforms and finding optimal strategies to develop novel immunotherapeutic agents for cancer treatment. Dr. Cao’s goal is to design the precision medicine approach for individual cancer patient groups for fully realizing the potential benefits of immunotherapy. 1. Du J, Cao Y, Liu Y, Wang Y, Zhang Y, Fu G, Zhang Y, Lu L, Luo X, Kim CH, Schultz PG, Wang F. Engineering Bifunctional Antibodies with Constant Region Fusion Architectures, Journal of the American Chemical Society, 2017, 139 (51): 18607-18615. 2. Cao Y, Rodgers DT, Du J, Ahmad I, Hampton EN, Ma J, Mazagova M, Choi SH, Yun HY, Xiao H, Yang P, Luo X, Lim RKV, Pugh HM, Wang F, Kazane SA, Wright TM, Kim CH, Schultz PG, Young TS. Design of Switchable Chimeric Antigen Receptor T Cells Targeting Breast Cancer. Angewandte Chemie International Edition, 2016, 55 (26): 7520-7524. Du J, Cao Y, Liu Y, Wang Y, Zhang Y, Fu G, Zhang Y, Lu L, Luo X, Kim CH, Schultz PG, Wang F.
3. Ma JSY†, Kim JY, Kazane SA, Choi SH, Yoon HY, Kim MS, Rodgers DT, Pugh H, Singer O, Sun SB, Fonslow BR, Kochenderfer JN, Wright TM, Schultz PG, Young TS, Kim CH, Cao Y† (Co-author with equal contribution), Versatile strategy for controlling the specificity and activity of engineered T cells. Proceedings of the National Academy of Sciences, 2016, 113 (4): E450-458. 4. Rodgers DT, Mazagova M, Hampton E, Cao Y, Ramadoss NS, Hardy I, Schulman A, Du J, Wang F, Singer O, Ma JSY, Nunez V, Shen J, Woods AK, Wright TM, Schultz PG, Kim CH, Young TS. Switch-Mediated Activation and Retargeting CAR T cells for B cell Malignancies. Proceedings of the National Academy of Sciences, 2016, 113 (4): E459-468. 5. 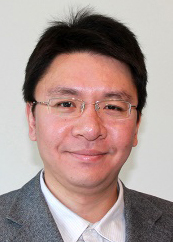 Cao Y†, Axup JY† (Co-author with equal contribution), Ma JSY, Wang RE, Choi SH, Tardif V, Lim RKV, Pugh HM, Lawson BR, Welzel G, Kazane SA, Sun Y, Tian F, Srinagesh S, Javahishvili T, Schultz PG, Kim CH. Multi-format T-cell engaging bispecific antibodies targeting human breast cancers. Angewandte Chemie International Edition, 2015, 54 (24): 7022-7027. 6. Kim MS, Ma JSK, Yun HY, Cao Y, Kim JY, Chi V, Wang D, Woods AK, Sherwood L, Caballero D, Gonzalez J, Schultz PG, Young TS, Kim CH. Redirection of Genetically Engineered CAR-T cells using Bifunctional Small Molecule Drug. Journal of the American Chemical Society, 2015, 137 (8): 2832-2835. 7. Wang RE, Liu T, Wang Y, Cao Y, Du J, Luo X, Deshmukh V, Kim CH, Lawson BR, Tremblay MS, Young TS, Kazane SA, Wang F, Schultz PG. An Immunosuppressive Antibody-Drug Conjugate. Journal of the American Chemical Society, 2015, 137 (9): 3229-3232. 8. Bull-Hansen B, Brandal MEB, Berg K, Cao Y, Skarpen E, Rosenblum MG, Weyergang A. Photochemical activation of MH3-B1/rGel; a HER2 targeted treatment approach for ovarian cancer. Oncotarget, 2015, 6 (14): 12436-12451. 9. Lim REV, Yu S, Cheng B, Li S, Kim NJ, Cao Y, Chi V, Kim JY, Chatterjee AK, Tremblay MS, Schultz PG, Kazane SA. Targeted delivery of LXR agonist using a site-specific antibody-drug conjugate. Bioconjugate Chemistry, 2015, 26 (11): 2216-2222. 10. Cao Y, Marks JW, Liu Z, Cheung LH, Hittelman WN, Rosenblum MG. Design Optimization and Characterization of Her2/neu-Targeted Immunotoxins: Comparative In Vitro and In Vivo Efficacy Studies. Oncogene, 2014, 33 (4), 429-439. 11. Bull-Hansen B, Cao Y, Berg K, Rosenblum MG, Skarpen E, Weyergang A. Photochemical activation of the recombinant HER2-targeted fusion toxin MH3-B1/rGel; impact of HER2 expression on cytotoxic outcome. Journal of Controlled Release, 2014, 182: 58-66. 12. Furman JL, Kang M, Choi SH, Cao Y, Wold ED, Sun SB, Smider VV, Schultz PG, Kim CH. A genetically encoded aza-Michael acceptor for covalent crosslinking of protein-receptor complexes. Journal of the American Chemical Society, 2014, 136 (23): 8411-8417. 13. Zhou H, Mohamedali KA, Gonzalez-Angulo AM, Cao Y, Migliorini M, Cheung LH, Lobello J, Lei X, Qi Y, Hittelman WN, Winkles JA, Tran NL, Rosenblum MG. Development of Human Serine Protease-Based Therapeutics Targeting Fn14 and Identification of Fn14 as a New Target Overexpressed in TNBC. Molecular Cancer Therapeutics, 2014, 13 (11): 2688-2705. 14. Cao Y, Mohamedali KA, Cheung LH, Marks JW, Hittelman WN, Rosenblum MG. Construction and Characterization of Novel, Completely Human Serine Protease Therapeutics Targeting Her2/neu. Molecular Cancer Therapeutics, 2013, 12 (6): 979-991 (Journal Cover and Highlighted Article). 15. Mohamedali KA, Cao Y, Cheung LH, Hittelman WN, Rosenblum MG. The Functionalized Human Serine Protease Granzyme B/VEGF121 Targets Tumor Vasculature and Ablates Tumor Growth. Molecular Cancer Therapeutics, 2013, 12 (10): 2055-2066. 16. Cao Y, Marks JD, Huang Q, Rudnick SI, Xiong C, Hittelman WN, Wen X, Marks JW, Cheung LH, Boland K, Li C, Adams GP, Rosenblum MG. Single-chain antibody based immunotoxins targeting Her2/neu. Design optimization and impact of affinity on antitumor efficacy and off-target toxicity. Molecular Cancer Therapeutics, 2012, 11 (1): 143-153. 17. Cao Y, Marks JD, Marks JW, Cheung LH, Kim S, Rosenblum MG. Construction and characterization of novel recombinant immunotoxins targeting the Her2/neu oncogene product: in vitro and in vivo studies. Cancer Research, 2009, 69 (23): 8987-8995. 1. Cao Y, Rosenblum MG. Design, Development and Characterization of Recombinant Immunotoxins Targeting Her2/neu. Antibody Drug Conjugates and Immunotoxins, Part VII: Immunotoxins, Chapter 18, 319-348, 2013. 2. Lyu MA, Cao Y, Mohamedali KA, Rosenblum MG. Cell-Targeting Fusion Constructs Containing Recombinant Gelonin. Method in Enzymology, Volume 502: Protein Engineering for Therapeutics, Part A, p. 167-214, 2012.